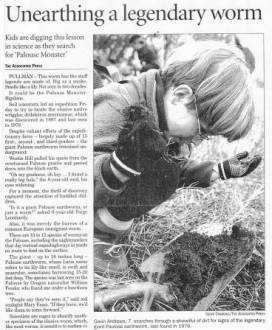 A specimen of the giant Palouse earthworm is found. Graduate student, Yaniria Sanchez-de Leon of the University of Idaho is apparently the first person in nearly two decades to find the specimen. The rolling hills of the Palouse sprawl across an estimated 2 million acres of north central Idaho and southeastern Washington. The white, lily-scented denizen in the region’s fertile, deep soils reportedly can grow to 3 feet long. The white worm found by Yaniria is 6-inch in size. While studying earthworm populations and carbon dynamics in native prairie and retired farmland, she found it from a remnant of Palouse prairie. Though, Sanchez-de Leon made this finding last May, Northwest earthworm expert William M Fender-Westwind confirmed the identification of the worm only recently. And this confirmation supported her initial identification and another by earthworm experts gathered for a workshop in her native Puerto Rico in November.